The Navy’s infrared search and track (IRST) system received Milestone C acquisition approval Dec. 2, authorizing low-rate initial production (LRIP) of the sensor pod. 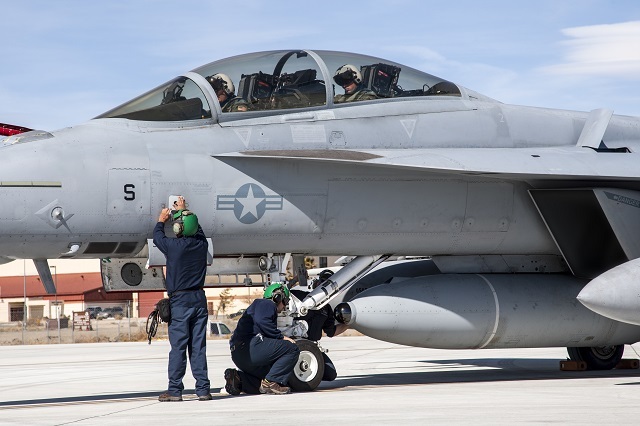 Boeing and Lockheed Martin are developing and integrating IRST, an essential upgrade to the combat capability of the U.S. Navy’s Super Hornets. Approved by Vice Admiral Paul Grosklags, Principal Military Deputy for the Assistant Secretary of the Navy (Research, Development and Acquisition), LRIP authorization provides the Navy’s IRST program with the six pods needed to achieve future initial operational capability (IOC). IOC is a key procurement milestone achieved when a military system or product meets operational capabilities before proceeding to full operational capability. The IRST system, managed by Naval Air Systems Command’s (NAVAIR) F/A-18 & EA-18G Program Office (PMA-265), is a long-wave infrared sensor pod that searches for, identifies and tracks heat sources at extended ranges. The IRST pod is a passive system that does not emit radiation, thereby hindering the enemy’s ability to detect the system. The pod allows simultaneous tracking of multiple targets under normal and electronic attack warfare conditions. The sensor pod is mounted within the Super Hornet’s centerline fuel tank, requiring no modifications to the aircraft’s airframe. The IRST system completed its first flight aboard an F/A-18F Super Hornet in February 2014. Following the Milestone C decision, performance and aeromechanical flight testing will continue to determine the IRST capability’s limits within aircraft constraints and to ensure operational stability and safety. These are critical steps toward attaining IOC, expected later this decade, Morley said. “The team worked hard to reach the milestone despite budgetary challenges during the manufacturing development and engineering phases of the IRST system,” said Michele Moran, PMA-265 Electro-Optics/Infra-Red integrated product team lead. PMA-265 will now transition into the limited production and introduction phases of the next-generation capability with the support of industry partners, Boeing and Lockheed Martin. In addition to the IRST system, next-generation capabilities incorporated in the Navy’s F/A-18E/F Flight Plan include advanced fused sensors, Active Electronically Scanned Array radar, counter electronic attack, Distributed Targeting System, multi-sensor integration, anti-surface warfare, IP-based linked networks and advanced air-to-ground and air-to-air precision weapons operating on an open architecture.